Belstaff "Momentum" top coat with underlay for additional warmth. Hooded collar; zip-up bib underlay; snap placket, Long sleeves; snap cuffs. Belstaff "Momentum" top coat with underlay for additional warmth. Hooded collar; zip-up bib underlay; snap placket, Long sleeves; snap cuffs. Standard silhouette. Side flap pockets. Above-knee length. Nylon/spandex self and back yoke. Machine wash. Imported. Bogner Fire + Ice "Cathy" down-filled coat. Stand collar; removable hood with drawcord. Long sleeves; logo patch at left arm. 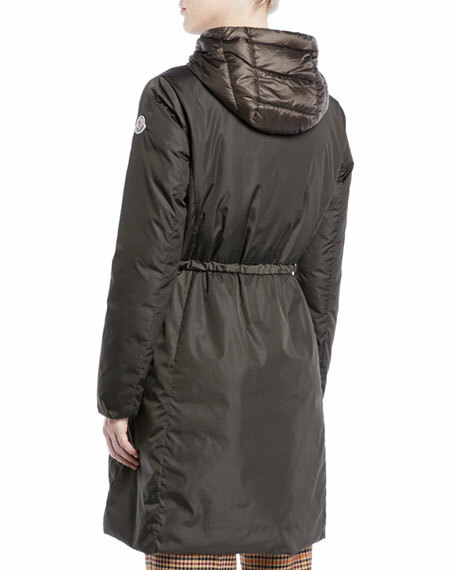 Mackage "Lara" fitted puffer coat. Features water-repellent and water-resistant finish. Stand collar; detachable hood with snaps and drawcord. Long sleeves. Mackage "Lara" fitted puffer coat. Features water-repellent and water-resistant finish. Stand collar; detachable hood with snaps and drawcord. Long sleeves. Fits true to size. Front zip closure. Fitted silhouette. Zippered pockets. Above-knee length. 90/10 duck down/feather fill. Nylon shell/lining. Dry clean. Imported.